No reviews found on the web! Read our reviews. This entry was posted in Vacuum Tubes and tagged 12au7/ECC82, 5814, Sylvania by florentinabortea. Bookmark the permalink. We tried a ton of NOS USA and also European tubes against this tube. In the end, this one, as we put it, “fit like a glove”. Though this tube comes in both three and two mica, we found the two mica to be the better tube. I do not think you can go wrong with either, so definitely have a listen to the three mica one if that is what is available. What is liked about this tube is not so much a sonic character as is the usual case with most tubes, but rather, just how well this tube was capable of doing everything exceptionally well. For example of a “character” type tube, one can always rely on Mullard for this;). The only word I can come up with to truly describe the tube is balanced. It does absolutely everything from top to bottom in such a cohesive manner that it is difficult to find any fault in it. Speaking of those character tubes, this one happens to be musical, something I associate more with balance. It is similar to speakers, where a truly neutral speaker will not have anything in particular stand out or be striking. A speaker of this nature would be the Tad Reference One. This said, the Tad can be indeed too much of a good thing for neutrality, and many will yearn for something with greater texture. The GB5814A actually has that very refined sound of the Tad, but it is incredibly musical in a very universal sense. For example, I have used a ton of different speakers with this tube, and the sound is flat out musical. So be it that you are using something almost contrasting with a Tad Reference One such as a horn or stat type speaker, you can still maintain that very musical/balanced/cohesive sound via the GB5814A tube. 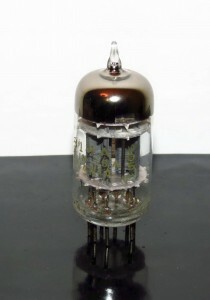 I am sure there are many tubes that may prescribe their own sound character that gives a little more of this or that, but I find it hard pressed to do much better than this GB5814A tube. It may not float your boat, or it may not be as I am describing it to be, but I have shared this gem with others that have what I consider to be highly colored setups, but they too can hear the beauty of this tube. Extremely highest regards for this tube, and one that I had to make my first review about because it was the one tube, that as I began this review, just fits like a glove! Great tube – so musical!! !